Maintaining a neutral pH level in your freshwater aquarium is crucial to your fishes' health. Rather than using harsh chemicals or expensive filtration systems, you can use household baking soda to raise the pH in your aquarium and keep your fish in good shape. The pH level of your aquarium represents the acidity of the water, with 1 being most acidic, 7 neutral and 14 most basic or alkaline. Baking soda is a strong base and will help to remove acidity from the aquarium. Measure the approximate pH level of your freshwater aquarium. Dip an individual pH measuring strip in the water and remove it. Let dry for roughly 30 seconds or until it quits changing color. Compare its final color to the manufacturer's chart to determine the water's pH level. Calculate how much you need to raise your pH level. Different fish function well with different pH levels. 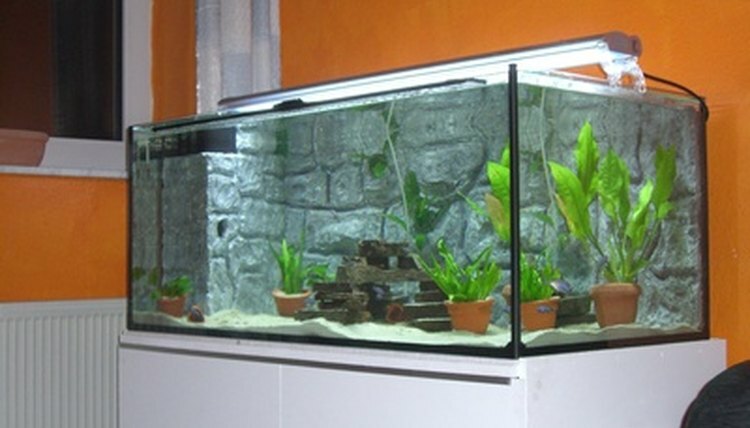 From 6 to 8 is generally safe, but some fish are highly sensitive to the pH level in an aquarium. To raise the pH slightly, use 1 teaspoon of baking soda per 5 gallons of water. For example, if you need to raise a pH of 5 to 6 in a 50 gallon aquarium, you need about 10 teaspoons of baking soda. Remove the fish from the aquarium and place them in a holding tank if possible. Stirring in baking soda and changing the pH level can shock or disorient your fish. Stir the allotted amount of baking soda into the aquarium. After several minutes when the baking soda is fully dissolved, measure the pH and repeat as needed. Avoid trying to drastically change the pH level quickly, as the baking soda may not all dissolve.